Topping Time! Haha Thursday edition. 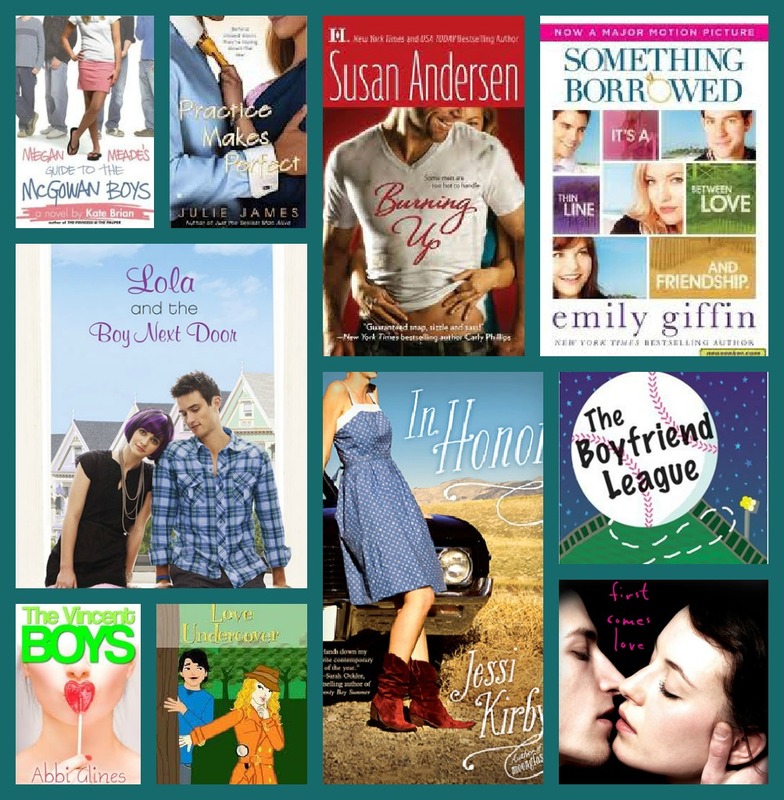 My Top Ten will show you will more about the loves in my life and books that I highly recommend. So, let's dive in. If you are tagged, you're name will be in bold. Love you guys! 1. Megan Meade and the McGowan Boys- With seven guys living with Megan as her "surrogate brothers" there's no wonder I found character inspiration. My good friend Yohan is exactly like Finn, the third oldest Mcgowan. They both allow their passions to encircle them. Yoyo doesn't have a shed he escapes too every time he gets inspiration. However, he always wearing head phones. Besides, they are both extremely nice and funny. 2. Practice Makes Perfect- Oh goodness. Ugh, have you ever met someone narcissistic and mean but, you still seem to want to be around them? I don't understand the appeal. That's how J.D Jameson seems in Practice Makes Perfect. The lawyer who thinks he's all that still manages to get under your skin. That's my friend Hunter. He's only slightly arrogant and rude but, they are essentially the same person. I've found though that like J.D, Hunter actually has a pleasant side. Though, he rarely let's me see it. 3. Burning Up- Macy in this novel is all about the flash and fun. She loves to attract males attention and they love it too. However, underneath it all, she's simply searching for that one person. Ashdani, a close friend from college, resembles Macy's demeanor. I love her for being unique and carefree. One day, her guy will recognize the gem he's found in her. 5. Lola and The Boy Next Door- Holy Moley! You guys know Patch. So, you know that she's is almost a spitting personality image of Lola. Lola is not afraid to stand out. She prides herself on her outrageous clothing. Have you seen Patch in her teenage ninja turtle onesie? Haha, if not ask her to post a picture. Most importantly, Lola has a deep connection to the one's she loves. In Patch's case, it's her family, us, and her coworkers. In return, we will do anything for her. 6. In Honor- I did a review about this book a few weeks ago. I'm still minorly obsessing. Honor, the girl, reminds me of someone really close to me. AND, not just because they both rock dresses and cowboy boots. In many ways, Randi is Honor. She's funny, extra beautiful, loves adventure, adores her brothers, and has a unique car. Get this. Her brother has recently enrolled in the navy. I'm not sure if they both talk via web cam, but I do know their relationship is ah-dorable. Final surprise is her brother does have a best friend and he's pretty cute. Maybe, they'll go on a road trip one day but, this time all three will be there to enjoy life, love, and the pursuit of celebrities. 7. The Boyfriend League- In this novel, we find that quiet Dani is truly a joy to be around. Without many words, she draws people, male and female, to her side. My friend Katelyn is similar to Dani. I've known her since middle school. Although she's still a gal of few words, I can hang out with her for hours. I'm assuming that's how Jason felt once he got to know Dani. 8. The Vincent Boys- I've recently met this girl. However, I feel like we're already friends for life. Maria is the reincarnation of Ashton. Both girls are athletic and the center of guys' attention. She'll probably kill me for writing this tomorrow at camp but, she's also involved in a mini love triangle. I will spare you the juicy details but, I need popcorn when the three are around. More importantly, Ashton struggles to show her true self. Fighting the opinions in her town, she's the one who comes out on top. That's our Maria. 9. Love Undercover- This selection is perfect. Kaitlyn, from Love Undercover, strives to be an undercover spy. She loves the thrill of a mystery. Somehow, in her world, the biggest mystery is guys themselves. Blondie is always the one ready for the action. Once we had a mystery on our hands, she found the solution before we could make it to the dorm... Blondie, who you know as Dexter, brings the funny sunshine in our everyday lives. 10. First Comes Love- I think I saved this one last for a reason. I mentioned my best friend, Roderick, in my review of this novel. He is exactly like Gray. He is the light of any fun activity. Yet, one switch and he's swept into a spiraling whirlpool of music and thought. At first meet, he appears to be calm and collected. Don't let him fool you. He is a ball of win. I have a strong alliance to the individuals that I befriend. They often tease me about my bizarre novel passions. However, this exercise is yet another example of why reading is so important. It's a communication outlet for other aspects that you love in life. In this case, it's my insane friends.